Part fundraiser and part environment awareness, the Rotary Club of Corowa is collecting batteries of all sizes - from truck to watch, size doesn't count. 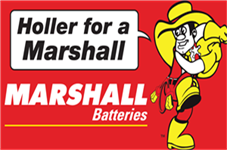 Don't throw them away, drop them off at one of Gary Poidevin's Marshall Battery stores in Bow Street Corowa, 1/427 Wagga Rd, Lavington, or 79 Thomas Mitchell Drive, Wodonga, where they will be disposed of properly for you. By sending them off for recycling we are not only raising funds for our projects, but also ensuring they don't go into landfill.